Saturday May 3rd was the maiden voyage of the Unsinkable 2. Well, she was in the water a week before that but Saturday was our first time to fly some canvas. 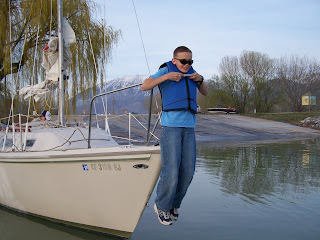 We purchased the 1977 Catalina 25 Swing Keel from someone in Fremont, California. It's very difficult to find the boat you want in Utah, and California seems to be oversupplied with used sailboats. So even when you figure in the cost of gas and the 2-3 day trip required to drive to California and back, it is cheaper to buy a boat in California. The kids really enjoyed the bigger boat, and we were immediately glad we'd made the decision to upgrade. Prior to this, we owned a Venture 21. 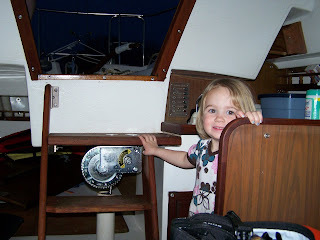 She was a great first boat for us, and we had many terrific adventures and overnight trips. But with 6 kids, the boat was quite cramped. We looked at a lot of bigger boats (than the catalina 25) however we wanted a swing keel and a shallow enough draft that we could sail well into October and still be able to pull her out of the water without a crane. The kids liked exploring the boat in the water - apparently having the boat in the water made it completely different than when it was on the trailer in the driveway. They tested each of the berths, explored the deck, and would have easily spent several hours in complete explorer mode. 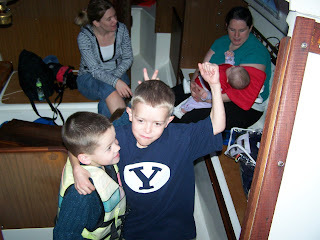 Here is a picture of #4 and #5 celebrating in the companionway. That's my wife in the back left and my sister in law on the right.